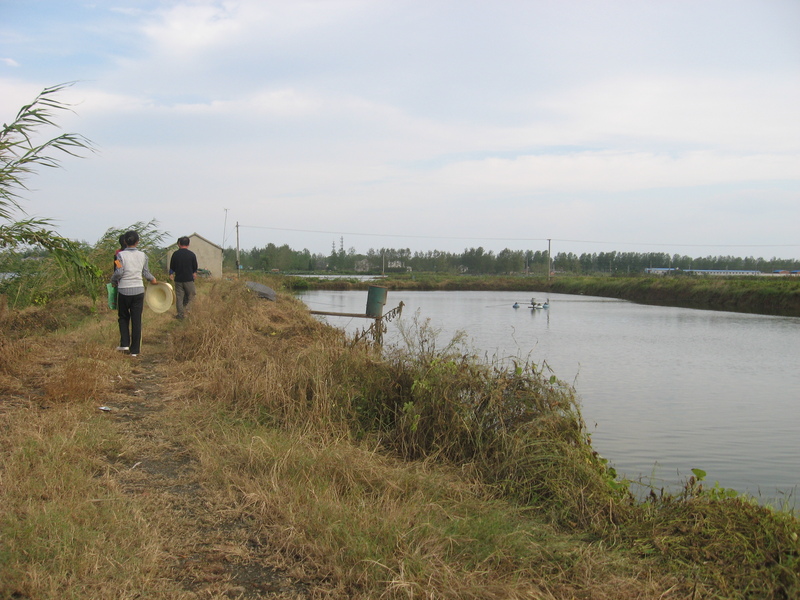 As promised I will be writing more detailed accounts of each of my 2010 field visits, starting with WWOOF visit # in Jiangsu: Julie and the fish farm. Julie, my first WWOOF contact, was twenty-five and working in Nanjing as an interpreter for a German contracting company (but she said her job was more like babysitting for her foreign employers). She grew up in a small village just outside the central city of Yangzhou; during our initial correspondence when I explained my research questions and desire to help on her farm, she clarified it is not technically a farm, but that her parents have land-use rights to a few rice patties in the village (collective land is allocated to villagers based on the demographics in their village). Because rice-harvesting season was fast approaching, she said she would be returning home to help her parents the week of the Mid-Autumn Moon Festival (the actual day of the Moon Festival was September 22nd) , and I was welcome to tag along. I eagerly accepted and made plans to take the train to Yangzhou the following Sunday where she planned meet me at the station. When I exited the station Julie was already waiting and waved me over. At first I couldn’t believe my luck of finding a contact that worked as an interpreter, but I was doubly-impressed when she spoke with a seamless British accent. She led me to the bus stop, and over the next hour it took to get to her village we chatted easily. She explained her cousin’s wedding had just happened a few days ago, but having already been introduced to Chinese wedding customs I knew this meant celebrations would still be going on when we arrived. Her cousin met us at the bus stop, and was easily discernible in the black Audi decorated with pink bows and flowers that are the trademark of wedding ceremonies. We drove through a small town that appeared to be mostly one long street lined with a few small restaurants, a grocery store, and various small shops that appeared indistinguishable in any trade because they all displayed everything from pipes to bike locks to fluorescent light fixtures. 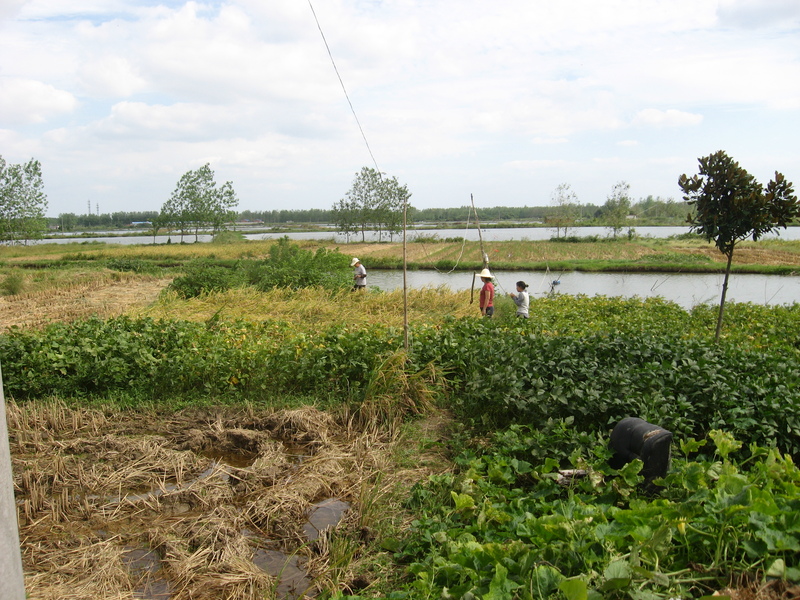 Just as the buildings began to intermingle with gathering plots of rice patties we turned down a small road that was broken by a cluster of houses and ended in a sea of patties interspersed with six perfectly square ponds that I would later come to find are for fish farming. Here’s me with Julie’s cousin’s daughters. We stopped at the cluster of houses and parked on the side of the road because the driveway was teeming with family members and friends getting ready to eat at the tables set with orange juice, baijiu, and small snacks. Julie led me to one of the far tables, which required I pass through a crowd of people that had all simultaneously turned to look at me, before seating me next to her father. I was then introduced to everyone at the table: mostly her immediate family and two young girls she said were her cousin’s daughters. They all began questioning Julie about me, along with a few relatives that were curious enough to stand next to the table and listen. We had initially communicated using Mandarin, so she knew I could speak a passable amount of putonghua (ordinary Mandarin), but she warned me that her parents speak a local dialect and often do not use putonghua. 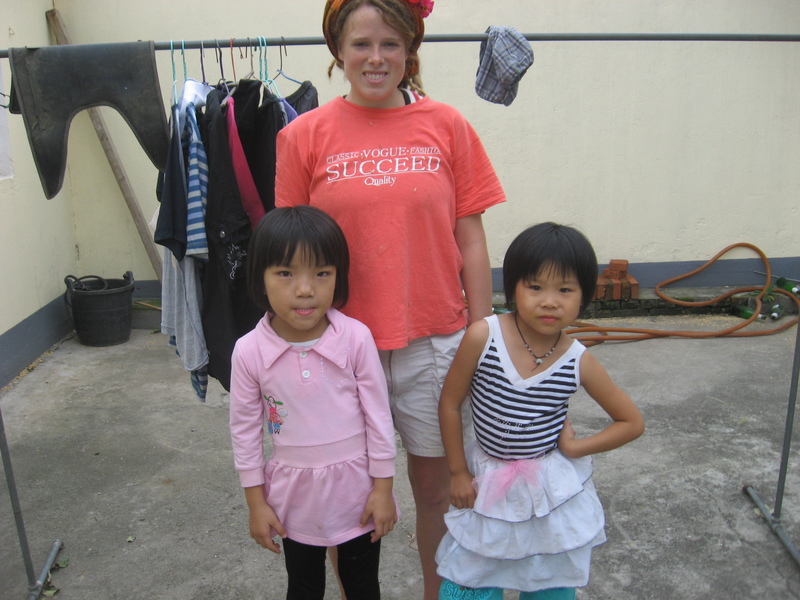 I quickly realized this was also true for everyone in the village, because Julie responded to their questions by telling them to direct their questions to me using putonghua. Usually this encouraged a smile and a shy glance in my direction before continuing in rapid Yangzhouhua (Julie later explained that in Jiangsu, there are at least 50 dialects, and even within the Yangzhou area there are different varieties– people that live only about 3 kilometers from her family will speak in a different intonation). Soon everyone’s attention turned elsewhere as the dishes started coming out. I’d prided myself by this point on becoming more or less accustomed to China’s diverse dishes, but quickly realized I had grossly overestimated my hutzpah when congealed duck’s blood, pig skin, and boiled chicken fetus appeared among various dishes of fish and fried vegetables. Julie, noticing my tendency to waver on the side of vegetables, explained that her mother and father suffered from high blood pressure and usually avoided meat as well. I was relieved that we would be eating mostly vegetables for the rest of the week, and simultaneously disheartened by my lack of grit, so at Julie’s grandmother’s offering I felt obliged to apportion myself a helping of pigskin before eagerly engaging Julie in conversation. I described to Julie my curiosity with China’s national land-use strategies and policy initiatives; particularly how those strategies are filtered down and implemented at the local level, and whether rural farmers are on board or resistant to these initiatives. I then asked her about the village’s relationship with local village officials, and she replied that they sometimes get together to have meetings and they seem just like neighbors, but the county-appointed officials get to decide who and how to use the land. For the right to use of a plot of land they will have an open auction, and the one with highest bid wins, but perhaps there will also be unseen deals. These officials can also decide if they need the land for public use, but then they may keep a lot of the money instead for development. Like when they build roads, they will construct them a few meters less than they should be so they can save money on concrete. In the west and south they [the governments] now have plans to develop farmer’s lands, so they move the farmers into compounds and flats they constructed while providing some compensation. Then these people must find jobs. Specifically, she described her Shanghai cleaning lady that used to own a farm but was forced to look for alternative work when she was relocated by the government. She said so far the people in her village have been lucky because developers haven’t come yet, but in the future they probably will have to sell their land-use right (Julie later explained that she doesn’t want to sell the right to use the land, but has always thought that when she retires she would like to return there to live and grow food). I asked if the villagers take any action to protest or resist reallocation/requisition of their land and she said no, they don’t. At this point Julie’s cousin and his wife began visiting each table; her cousin toasting the men with a cup of baijiu (although Julie whispered to me that her cousin’s glass was probably just water to avoid any drunken display), while his wife received money from her husband’s family members. Julie laughed and said if she ever needed money she would just get married, then somewhat more seriously added that now that her cousin was married her relatives will all be questioning when she has plans to marry. As we continued eating Julie motioned to her Dad who was seated to my left, and he raised his glass in a ganbei (cheers) motion to me before helping one of the girls that was seated on his lap to a piece of food on his plate. Julie then explained that her father had suffered a stroke a few years ago and was still slowly recovering. By the time the last plates were brought out most people had already finished eating. The tables had been set up on the cement patio in front of Julie’s cousin’s and wife’s house; directly to the right was Julie’s house – two stories with a cement patio in front and a small garden out back that gave way to a bank and shallow stream. We made our way inside and she showed me the bedroom we would share before leading me to the bathroom that was situated in the backyard above what I concluded must be the pigpen given the intermittent sounds coming from below. That night we fell asleep on a bed covered in bamboo mats and draped with a mosquito net. We asked each other questions about our families, and this soon led to a discussion of the one-chid policy, as Julie herself is an only child. Julie explained that she would like to have siblings, and that because she was a female her parents were allowed to have another child, but that they decided they only wanted one. Although the policy is much less restrictive now, it used to be very stringent– even if someone was willing to pay the fine they would have to hide away during their pregnancy. The next morning we woke up to Julie’s mom frantically calling for us to help move the rice inside– the sky had clouded over as if it might rain, and the rice was still laid out to dry on the patio from the previous day, so a sudden rainstorm would surely ruin it. We quickly went to work moving the rice from the large cement patio to a large metal cylindrical container stacked in a small shed off to the side of the patio. Then, just as we were close to finished the radio broadcast (followed by a loud groan from Julie’s mom) announced it would not rain, so we rapidly laid the rice back out again. 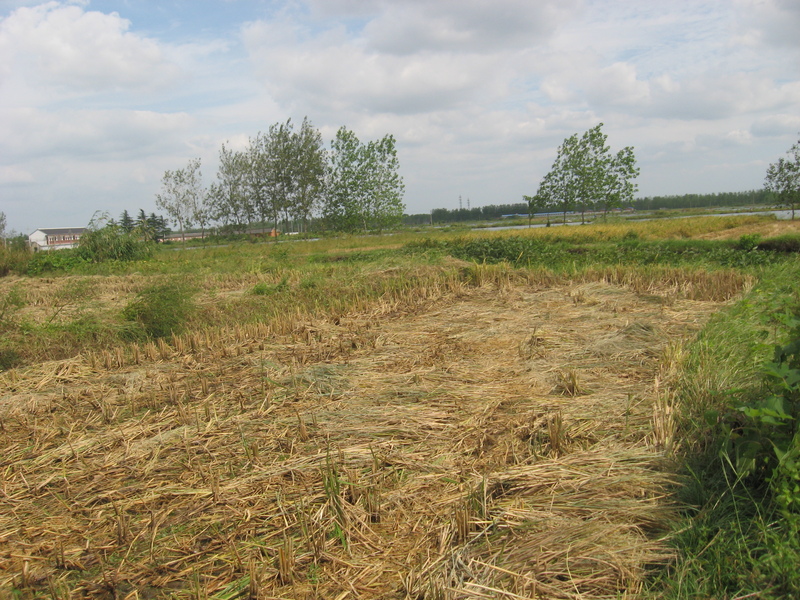 One of the family’s rice plots, after it had been harvested. By the time we finished the sky had cleared so Julie and I set out for a walk with her dad. While he quickly strode ahead of us, picking up his knees in a rapid gait, Julie and I lagged behind as we talked. She explained that her village has twenty families – about 100 people. They each have their own small plots to work, but like her dad, most people also work in other forms of business other than the farms. Before her dad had a stroke he used to go to places like Beijing to paint and would only come home for the harvest season. 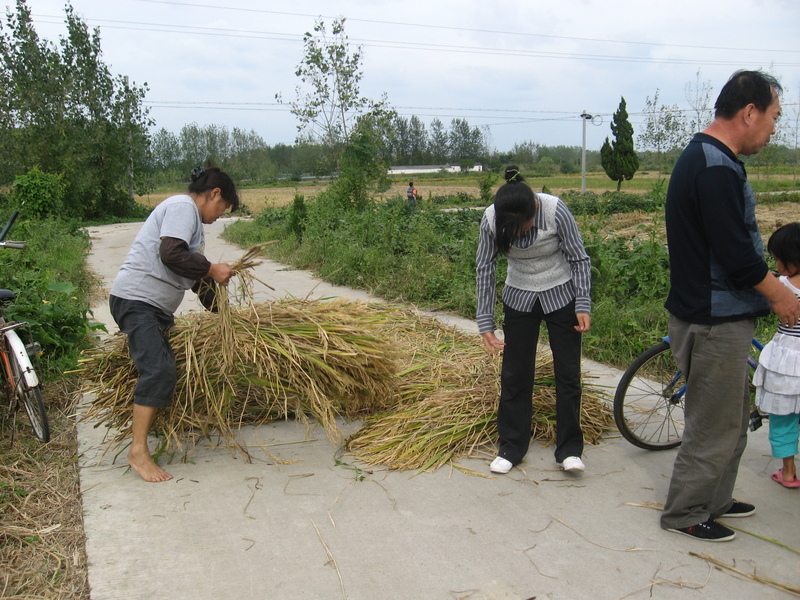 This practice is typical of many rural families; there are now an estimated 260 million migrant workers in China. Despite previous regulations restricting rural to urban migration, the government is now encouraging rural citizens to find work in local towns and cities with incentives such as subsidized housing and permission to transfer land-use rights without going through local government officials. And, most recently: an incredible plan to move 250 million farmers to cities. By encouraging farmers to move to larger towns and cities the government hopes to integrate many of the ‘noodle’ plots that now compose rural villages since the 1978 reforms and the allocation land-use rights to individual families (while remaining collectively-owned). Theoretically, integrating land plots would result in more efficient grain production, however policy implementation at the local level often involves a much more complicated dynamic than China’s perceived top-down chain of command might imply. As we continued walking Julie pointed out the ponds I had noticed when we first arrived and explained that the fish farm belongs to the community, but collectively they rent it out to people from other villages and then split the revenue to invest in irrigation and other farming necessities on their individual plots. She said it is not possible for people to make a living just from farming; many villagers get jobs in the factory or other places, but still return home for the harvest season. Like many women in the village, Julie’s mom works in a local toy factory making the eyes of dolls and stuffed animals. 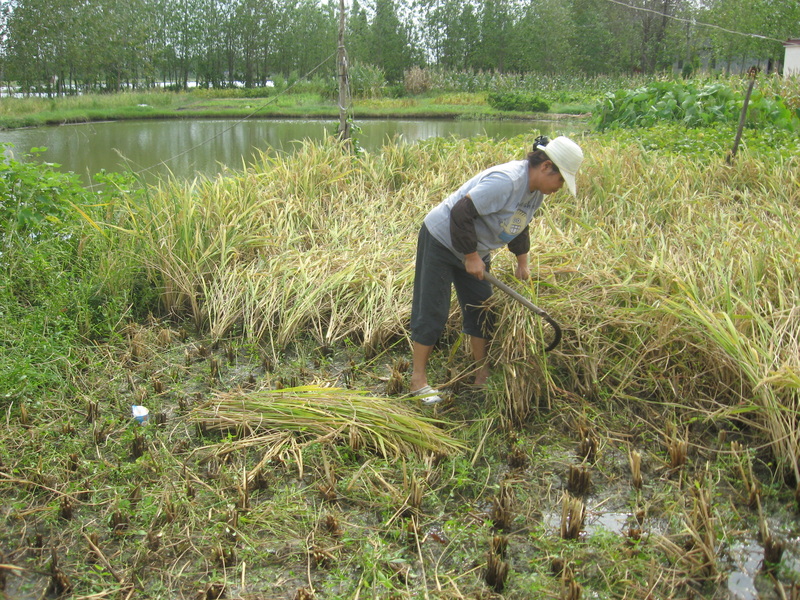 During the harvest season she wakes up early to lay the rice out to dry before work, and still returns home during her mid-day break to quickly eat lunch then turn the rice over. After we returned to the house and sat sipping tea at the kitchen table, I listened while Julie and her father described the changes that have occurred in the village. Because her father traveled to the city to work, their family always had enough money and could often afford commodities others in the village couldn’t: twenty years ago theirs was the first house in the village to have a telephone, despite having to pay China Mobile an outrageous installation fee of 3-4,000 Yuan. Julie then recalled a conversation she had with a taxi driver who also had installed a telephone before others in his village– in an entrepreneurial spirit he decided to charge a minimal fee like one yuan per minute for other villagers to use his telephone, and that way he easily made a return on the initial costly installation investment. In 2005 Julie’s family was also one of the first houses to have a refrigerator; Julie’s tone turned nostalgic as she said the things people make now are not as good as before. Their fridge works fine, but the refrigerator others have will undoubtedly have problems and people will need to be called to fix them. She pointed to the wall, and said there are no cracks, but her cousin’s new house has cracks and leaks, and the quality of cement isn’t very good; “people will do anything now to make a profit,” she concluded. Turning to the subject of medical care Julie said her village is a model for health care and the pension program, but the local medical care is still inadequate; instead her family must travel forty minutes to the hospital in Yangzhou because the better doctors will not visit the village. Although, she said in the mountainous regions the situation must be much worse. As she continued explaining the changes her village has seen, she reiterated what her grandfather had told her: life used to be very hard; during the Great Leap Forward they [farmers] had to give too much grain to the government, even when there was not enough food to feed their own families– at one point he had to rely on pig grain for lack of other sustenance. Before the reforms, she said, food was worth more than money. In the evening, after another extravagant dinner with Julie’s relatives and neighbors, I confided in Julie my affinity (at this point more like a compulsion) for running and she offered to accompany me on a quick jog. We set off on the same path we had taken that morning with her father, and on our way back I realized it was easy to maintain almost the entire cluster of houses that composed the village in my periphery view. While observing the size of the village, Julie said there is a policy that if a village has less than twenty families the government will require everyone to move to another compound to make room for industry or large farms. The following morning Julie and I accompanied her dad for a walk to a nearby village. This village had a small park designed for exercise, and it was paved with small stones protruding from the cement. I quickly learned these stones were used for acupuncture as her father removed his socks and shoes and gently began to walk over them, albeit gently as though he were walking on hot coals. Meanwhile an older man was pushing his granddaughter on a nearby swing, and noticing my presence he said, “now you have seen the dark side of China.” Julie laughed and replied “not really”, then turned to me and explained that for the Chinese everything is about saving face, they want foreigners to stay in the city so they only see the ‘bright side’ of China. 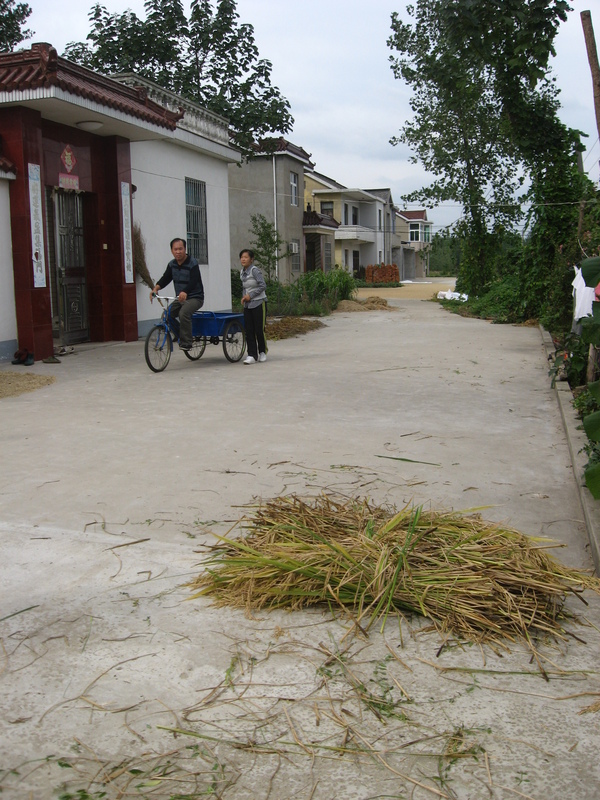 The path we followed back to the house was bordered on either side by rice patties being harvested by men using machines. I asked Julie if these men were only cutting their individual plots or if everyone helps each other harvest their rice patties, and she replied that neighbors will often help each other finish the work– for example her mom was going to help cut a neighbor’s plot– but the machines we observed the men in the field using actually belonged to people from another town: a few villagers collectively rented these machines, and then paid these men to come from the inland province of Anhui and cut the rice. 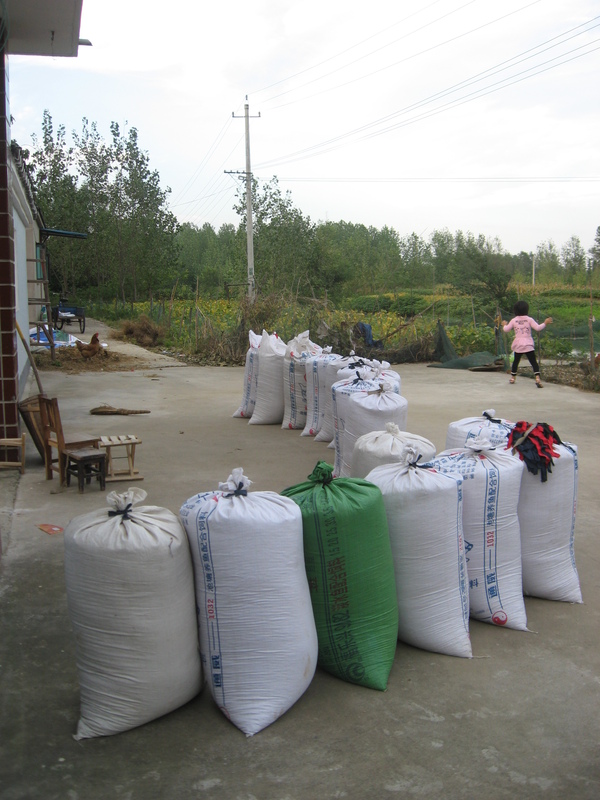 Later that afternoon we picked up all the rice we had laid out to dry, and again filled the large metal canisters we hadn’t previously finished filling before setting off to a neighbors house to gather the rice that had been cut by machine earlier that day. Julie’s dad owned what they called ‘a tricycle’, really a bicycle with a two-wheeled trailer attached in the back, that could be used for hauling anything of substantial size or weight, including rice. At the neighbor’s house we worked filling the tricycle’s trailer with rice and Julie’s dad would then ride the tricycle back and forth to their house once it was full. That’s the tricycle in the background. Wanting to be as helpful as possible, I attempted to take over cycling duties from Julie’s father after he had carted a few loads back and forth. Julie abruptly stopped me and said, “you can’t ride a tricycle,” but she let me attempt anyway and see for myself. I took off, and much to the village’s bemusement rode the tricycle back to Julie’s house while neighbors watched and gave me a thumbs-up sign. As I rode back to pick up another load of rice three neighbors even approached me to comment how clever I must be to know how to ride a tricycle. Initially anxious they might be patronizing me, Julie abated my fears and explained that many of them are unable ride a tricycle: she and her mother both can’t ride because learning to first ride a bicycle had inhibited their tricycling-riding abilities. 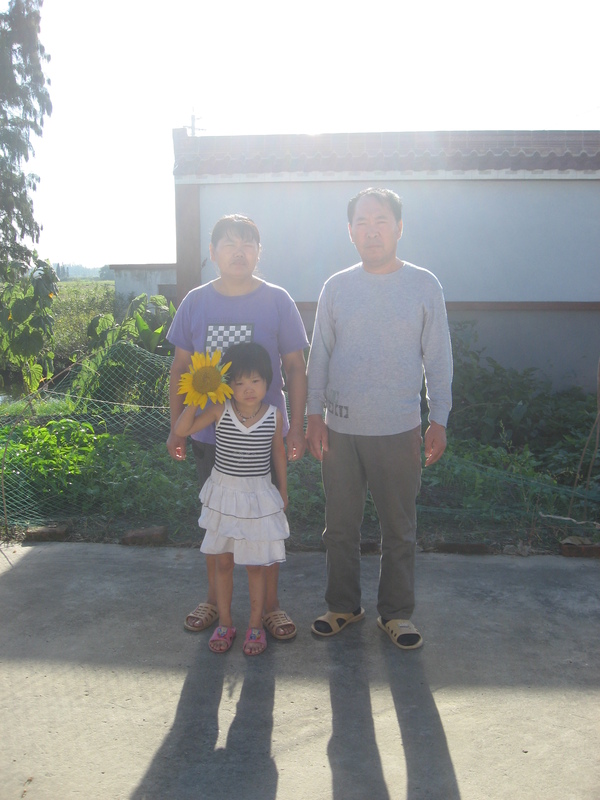 Her father had learned to ride a tricycle out of necessity after his stroke. 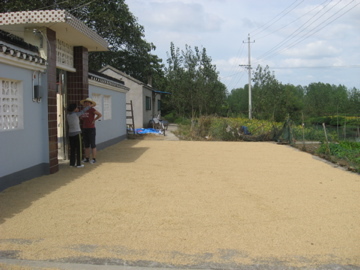 The rice laid out on the patio to dry. We finished moving all the rice, and returned to lay the rice out on the patio in front of the house. Julie explained that her family sells their harvest as soon as it has been collected and dried. For a price of 1.04 kuai per each half-kilo, they will sell it to someone like an “in-between” man who will then sell the grain for a profit to the government. He surely sells it to the government, she said, because he will sometimes mix it with mud and water to make it heavier and sell it for a higher price; the government would likely not bother to check, but a private company might. The following day is the mid-autumn moon festival, and each year Julie’s family gathers at her aunt’s house on the other side of town. Julie’s mom and dad doubled up on their motorbike, which left Julie and me with the choice of a bicycle and a tricycle; by default I rode the tricycle. We rode back through the town we had first passed through on my initial arrival (the one with all the indiscriminate shops displaying miscellaneous items) for no more than twenty minutes, but sufficient time for three passerby’s to gaze while questioning Julie how a foreigner could ride a tricycle. When we arrived at Julie’s aunt’s house, the family reunion was already underway. Despite the drizzling rain a few kids played in the driveway, but stopped to help cover our bicycles with ponchos to keep from getting wet. Julie then led me to the kitchen where many of the women were already making lunch, and we were assigned the task of preparing cucumbers (luckily for me all that required was chopping, so any obvious displays of my inadequate cooking skills were kept to a minimum). After lunch all of the women gathered in the kitchen to make traditional cakes for the moon festival. A large vat of dough similar to sticky rice sat in the middle of the tables, indicating that we would be at work for at least the next few hours. I first watched as the women took palm-sized balls of dough, flattened them, then spooned a dollop of sweet sesame paste or a medley of vegetable paste onto the middle of the dough before balling it up and flattening it down into a round cake. Once I was sure how to proceed I joined in while trying to listen in on their conversation (any second-language learners know that trying to eavesdrop on a conversation is a whole separate skill level than simply engaging in conversation). At one point the phone rang, and I heard the women who answered explain to whomever was on the other line her excitement of having a foreigner in the kitchen helping make cakes, which led me to add some gusto to my cake-making: demonstrating my eagerness to participate was the only way I knew how to express my appreciation to them (especially Julie) for so graciously accepting me into their home and allowing me to glimpse this unique facet of rural life. Meanwhile, most of the men sat in the living room chatting and watching television; occasionally some would linger at the kitchen’s threshold and observe our progress, but it was only two of the younger boys that ventured so far as to help us, moving our cakes from the table where we worked to the stove where Julie’s mom sat tending the fire. By the time we had finished it was already getting dark. Julie and I uncovered our bikes while many of the relatives watched and giggled at my tricycle-riding. As we rode back Julie explained that most of the cakes would to be given away as gifts, but when we returned home her parents had also prepared a plate of cakes for dinner. Before we sat down to eat, they moved a small table outside to the patio, covered it with a cloth, and placed on top two candles, incense, lotus roots, a few moon cakes, and a cup of tea. Julie’s mom half-jokingly said I would think it was funny that they would watch the moon, which caused my constant underlying anxiety over appearing to be anything less than a humble foreigner to grow a notch, and I tried to overcompensate by enthusiastically grabbing a seat at the table next to Julie’s father to join their vigil. In an attempt to engage in conversation and demonstrate my interest in their tradition, I asked the first question that popped into my head – why the moon?. Julie turned the question to her Dad, who replied he also didn’t know, it was just what he was always taught. Julie then said that people often look at the moon with nostalgia and think about their families, and the moon festival is a time when families come together, particularly because it is the harvest season. Her father then set off a few fireworks, signaling the end of our homage. The rice, bagged and ready to sell. The next morning we began by spreading the rice out again on the patio, for what would be the last time. Julie said they will sell 1/3rd of their rice the following morning, but that all the rice we had moved into the two barrels on the side of the patio will be theirs to eat over the next year. That afternoon it was time to reap the rice patty. Julie said that her family had two patties large enough to be cut by machine, but one was quite small and would need to be cut by hand. I was excited on multiple fronts– after spending most of the past year in a classroom or library, I had not only come to romanticize the prospect of physical labor, but I also felt that getting ankle-deep into a rice patty would epitomize the disintegration of a curtain that I felt shrouded my image of China and I would finally see, at least a keyhole glimpse, the root of where rice comes from through the lives of people that produce it. Julie’s Mom, Dad, and cousin laying the rice out on the road to be flattened by passing cars. A small procession of family members and neighbors walked with us a few houses down and waited on the street while Julie, her mom, and I slid down the bank and mucked our way over to the plot that was easily decipherable through all the rice stalks that had already been cut around it. A hand-off system was devised where Julie’s mom began by cutting a bundle of stalks that I then carried over to the bank where Julie waited, and she then placed the stalks in the back of her father’s tricycle, where he drove them over to the main street where Julie’s cousin laid them out on the road for cars to flatten out by driving over them (it is only later that her family will lay them out on their cement patio to dry). The entire process didn’t last long, an hour at most, and was swiftly finished when a friend of Julie’s mom arrived to help finish cutting the stalks. By this time it was evening and the sun was nearly setting. For dinner, Julie said we would first go catch fish at the local fish farm I had noticed when I first arrived. 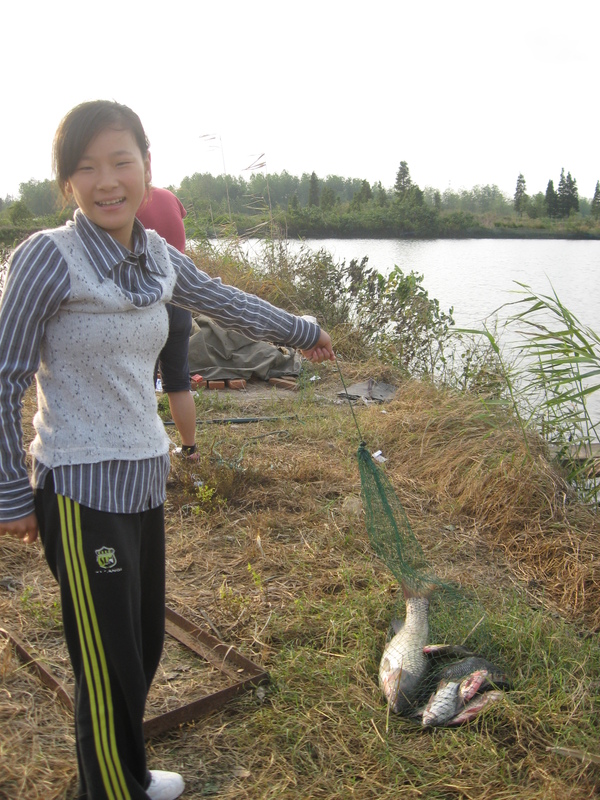 At her house we grabbed a fishing pole and pack of cigarettes as an offering to the fish-farm boss in exchange for allowing us to cast in his pond for the evening. Julie told me the fish-farm boss rents the fish farmland from the village collective, and he will often let villagers catch fish when they ask. So Julie, her father, cousin, neighbor and I all set off down the same path bordered by rice patties that we had taken for walks with Julie’s father. 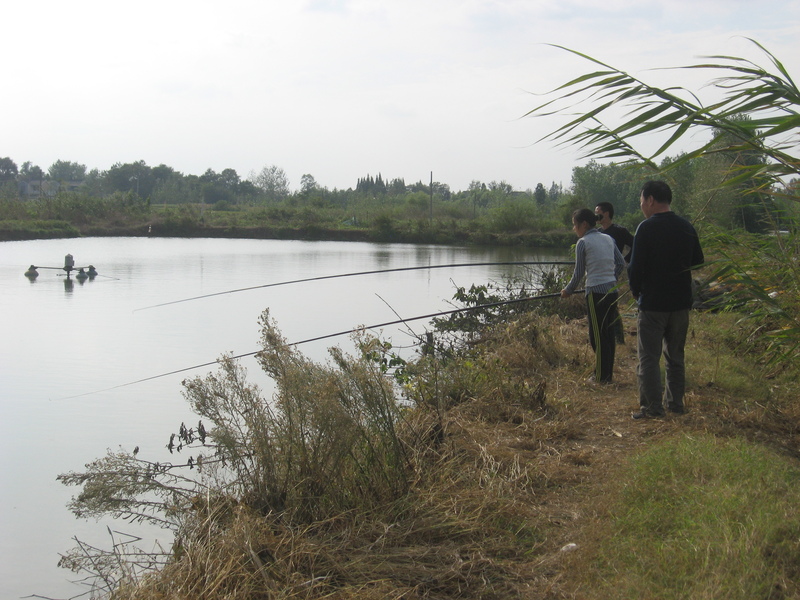 After a short exchange of pleasantries with the proprietor we assumed our positions at the edge of one pond, with Julie’s neighbor and dad taking the first casts. 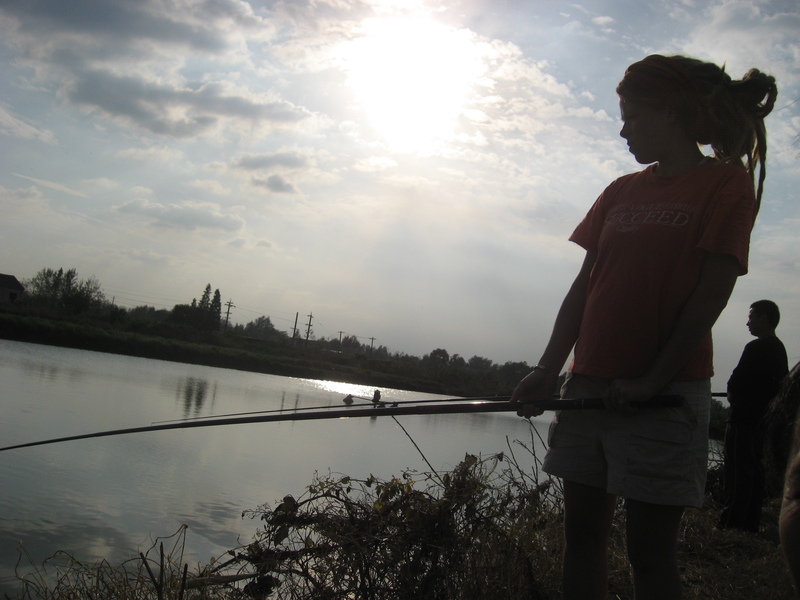 When twenty minutes had passed and only the neighbor had yielded a small fish the size of my hand (despite Julie’s cousin tossing in fish food alongside our rods) Julie’s father handed his reel off to me. Never having caught a fish before, I laughed nervously and threw the line out in the pond as far away from the bank as I could muster. Expecting my luck wouldn’t be much better, I fell into daydream mode, but was snapped back when Julie and her dad began shouting, “la! la!”. I pulled the pole out of the water to find a fish slapping about at the end of my line. I hauled it up onto the bank where Julie’s cousin helped detach it from the hook and place it in a net we had submerged in the pond. I successfully repeated this process three times, before handing the rod back to Julie’s dad and joining her cousin who was busy weaving rings and headbands out of the tall grass at the edge of the bank. Our fishing expedition came to an end when Julie’s neighbor yelped in excitement as his rod strained under the weight of what was obviously a massive fish. He abruptly handed the rod off to Julie, removed his shocks and shoes, jumped into the pond, and plunged both hands under the water. After some grappling he managed to haul the fish out and toss it on the bank where it flopped about before it was secured inside the net with the rest of our catch. Satisfied with our success, we waved goodbye to the fish-farm boss, packed the tricycle with the rods and fish, and headed back to the house. Check out the size of the fish on the left. Julie’s cousin announced our return while displaying the neighbor’s catch for everyone to see. I do hate to play into the fish-size-myth stereotype, but this one was large enough justify a party. Julie’s mom immediately set about preparing it while the neighbor and his family, along with a variety of friends, sat outside with Julie’s father chatting casually. In expectation of a large group for dinner, Julie’s mom asked us to ride into town to buy some oil and beer. We set off, and Julie explained her family usually has enough oil for the year from her village’s harvest, but because harvest season was just ending they would need to purchase some from the local store before this year’s yield would be ready. 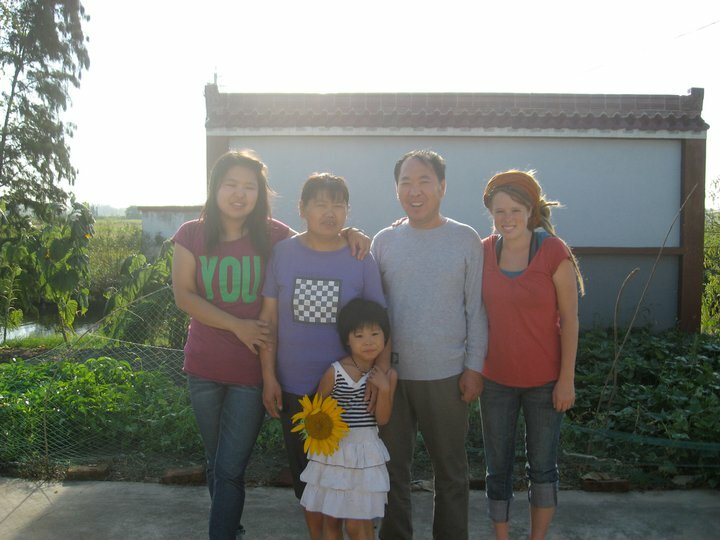 As we passed the elementary school Julie had attended, she explained that when she entered middle school she had to move away from home and live in the school’s dorms. She said this is often still the case– when families live too far to commute everyday the children must live at school. Now she has also heard of parents moving to the city to accommodate their kids and continue taking care of them. She even spoke of one woman she knew who quit her job to move to the city and now spends all day waiting on her son. In contrast, she credited her middle and high school boarding experience as having helped develop her independence. We completed our task and rode back to the village where a group of ten or fifteen neighbors and friends were already gathered around the dining table that was set with the fish in the center and surrounded by various other dishes. Julie said that after her father became ill her neighbors and relatives would come by to ask how he was doing and if there was any help her mother needed; to show her appreciation her mother will often cook large dinners for their friends and family. After we finished eating many of the guests stayed to chat. I sat quietly eavesdropping long enough to listen as their conversation meandered from worries about inflation to the exchange rate of the Yuan to the dollar. Julie and I soon retreated to her room to pack our things, and the following morning we set out early to catch our separate trains. 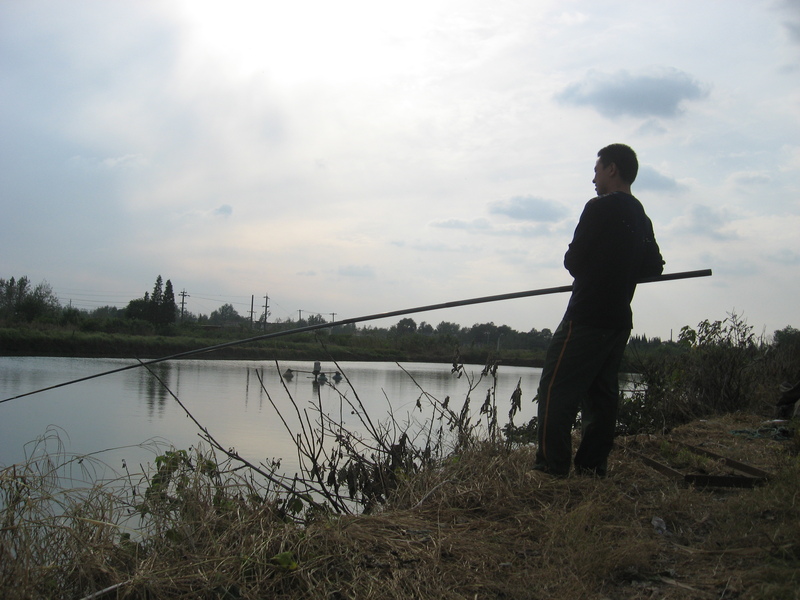 This entry was posted in 2010 Rural Field Visits and tagged fish farming, rural China, wwoof china. Bookmark the permalink. Hi! Such a pleasure to read your blog. I am currently studying aquaculture, and I would love to do WWoofing in a farm (or family) that raise fishes. Would you have any recommendations for me? (oh, and by the way, going to China in August, and I speak very little mandarin). Thank you! Please feel free to reach out with any other questions or anything else I might able to assist with!